Cast: Steve Martin, Emily Mortimer, Andy Garcia, Jean Reno, Aishwarya Rai Bachchan, John Cleese, Alfred Molina, Jeremy Irons, Lily Tomlin, Geoffrey Palmer. 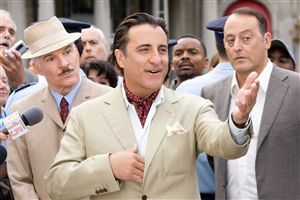 Story: Clouseau on the trail of another master criminal. Sometimes you know a movie's going to be shite before you watch it. And still I sat through it. I have a theory about The Pink Panther 2 - I think it's the actors' graveyard. If this is true, we won't see a good movie containing any of these stars - Steve Martin, Jean Reno, Andy Garcia, Emily Mortimer, John Cleese, Alfred Molina, Jeremy Irons, Lily Tomlin ... how did they get all these big names anyway, considering the previous episode was so naff? Only Bollywood star Aishwarya Rai stands a chance of a blossoming career, but even she is disturbingly Americanized in this movie. Peter Sellers made the original Pink Panther movies - with a lesser actor in the lead they would've been hopeless. And that's exactly what we have here. Steve Martin is easily the worst thing in the movie, being painfully inept at portraying ineptitude, ironically. 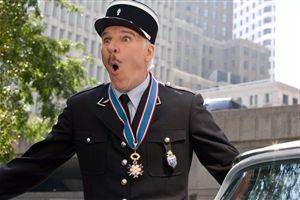 Further irony can be drawn from the observation that it's usually highly amusing watching Americans trying to do a French accent - but Steve Martin goes so far beyond crap that it removes all humour leaving a dry husk of a performance that has no redeeming qualities whatsoever. Truly deserving of a Razzie. The Pink Panther 2 is marginally worse than the previous episode. Don't even think about watching it if you've seen any of the Peter Sellers originals and merely average otherwise, with an appalling central performance. I think the average moviegoer will enjoy it: 3/5 provided you're not a Sellers fan. To enjoy this film: be young enough to have no idea who Peter Sellers is. The Pink Panther 2 was released in the UK on 13th February 2009.